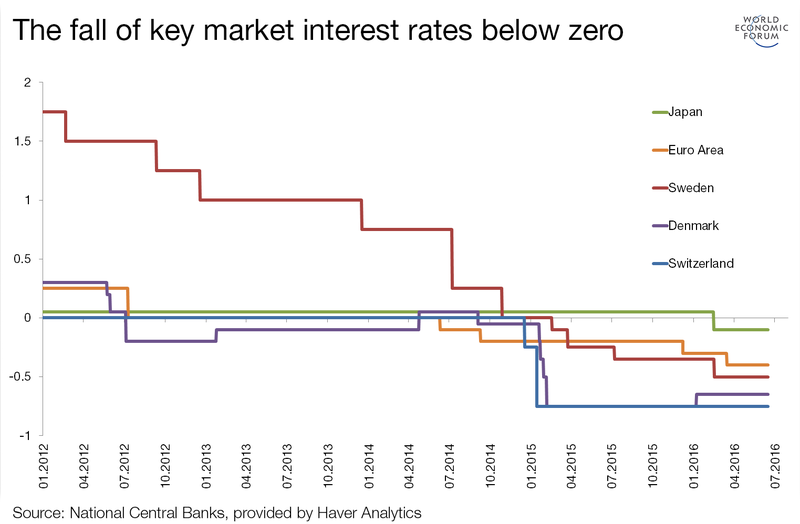 Does the monetary tactic of cutting rates to below zero actually work? And if so, how? Watch the Monetary Policy: Where Will Things Land session from the World Economic Forum's Annual Meeting 2017 here. Since the great recession, a large number of advanced economies have been stuck with low growth and low levels of investment and inflation. Attempting to regain growth, central banks have taken increasingly forceful monetary measures. Of these, perhaps the most controversial and least understood is negative interest rates. The central bank of Denmark was the first to go below zero, in 2012. To the surprise of many, it did not result in stress in the financial system. In 2014, several of Europe’s central banks followed suit. Two years later, so did the Bank of Japan. Setting interest rates to below zero is often viewed as an unconventional policy, but it can actually be seen as a continuation of the perfectly normal monetary policy practice of moving the short-term interest rate in response to fluctuations in the economy. There is a limit to how low interest rates can go, but it turns out that this limit is not zero and we have not reached it yet. Interest rate cuts below zero largely work as they do in normal times with positive interest rates, though there are some differences: the effects on banks, for instance, and the psychological impact of interest rates plunging into negative territory (more on this below). Throughout history, it was widely believed that central banks could not move short-term interest rates below zero. After all, why would anyone pay to deposit money in a bank or pay to lend someone money, when they could just keep their cash at home for free? Cash always has a zero interest rate. It was widely believed that if interest rates did dip below zero, even if by a very small amount, everyone with savings would run to the bank to change them for ready money. The zero interest rate on cash was seen as the lowest point an interest rate could dip to, the point at which central banks would be out of ammunition. Economists have come up with different ingenious proposals to circumvent the zero point and regain central banks’ firepower. In the 19th century, Silvio Gesell proposed a tax on holding cash. In 2009, Greg Mankiw suggested a lottery scheme for randomly picking serial numbers on bank notes and declaring them void, making it risky to hold on to cash. In 2014, Kenneth Rogoff explained that if we could just phase out cash altogether, there would be no alternative to paying a negative rate on bank deposits and bonds. And there are other proposals, too. When central banks started dropping interest rates to below zero without adopting any measures to make cash costly to hold, it changed the prevailing worldview. Zero was no longer the lower bound on interest rates. It turned out that many were actually willing to pay for the convenience of not having to hold their savings in cash. The example of Switzerland suggests that interest rates can go at least as low as -0.75% without triggering a large demand for cash. Views have been voiced on where the effective lower bound might be and what it depends on. But in the end, we still do not know; no country has reached this point, and it remains unknown just how much further interest rates can be cut before we see a broad shift into cash. How do interest rate cuts below zero work? Central banks hold money for commercial banks. If the interest rate is cut below zero, it means that they, the central banks, can charge the commercial banks interest on that money. The commercial banks, meanwhile, can cut the interest rate that they charge their customers by the same amount and make their money back; although there are some crucial exceptions for some bank deposits, which we discuss later. Imagine a pension fund is holding a deposit with a commercial bank. If the interest rate drops, the fund might seek to buy financial assets with a higher return, such as bonds (which are like long-term loans). This increases demand for, and therefore the price of, these assets, which is how the rate cut is transmitted to the broader financial market. To compete with cheaper capital-market financing, banks might also reduce the interest rates they charge on loans. 1) Banks can lend more to households and companies, rather than holding on to cash, which has now become costly. 2) Businesses can invest more, as funding investment is now cheaper. 3) Households could save less, or borrow to spend more. 4) Demand for the currency could fall. This might lead to a depreciation of the currency, an increase in the price of imported goods and growing demand for the country’s now cheaper exports. Some have argued that in countries with ageing populations, incentives to spend will fall on deaf ears. Faced with negative interest rates, savers and retired people who live off their pensions could be more likely to reduce their spending, because they either have fixed savings targets or because they live off the interest from their capital. There is no evidence that savers as a whole suddenly react in this new way to interest rate cuts into negative territory, however. The fact is that for every saver in an economy, there is someone on the other side borrowing this money. Think of new house owners with high mortgages and car loans, start-up companies – or even the government. The increased purchasing power of borrowers due to negative interest rates might easily make up for the supposed frugality of retirees and other savers, as explained here. What does a central bank actually do? The kind of interest rate we’re all familiar with is called a nominal interest rate. It measures the amount of money we earn in a year on a saving of $100. A real interest rate, on the other hand, measures how much the $100 is worth in terms of what you can buy with it a year later. If you want to buy bananas, for example, and bananas cost $1 now but will increase to $1.03 in a year because of 3% inflation, and your $100 in the bank pays no nominal interest rate, then after a year you’ll only be able to buy 97 bananas; your real interest rate is -3%. Inflation in this case amounts to a negative real interest rate. Conversely, if the price of bananas falls to 97 cents after a year (3% deflation), then your $100 will buy you about 103 bananas and your real interest rate is a positive 3%, even if you don’t receive any nominal interest on the savings. So the real interest rate, which really matters for the value of your savings, depends on the nominal interest rate, but also on inflation. In countries where the inflation rate is higher than nominal interest rates, real interest rates are negative, and your savings fall in value according to what you can buy for them. In countries where inflation is lower than the nominal interest rate, on the other hand, the real value of your savings increases. In the United States today, short-term real interest rates are negative, as US inflation is positive but interest rates are still close to zero. If you have a bank deposit or a bond denominated in dollars at a close-to-zero nominal interest rate, your savings are losing value in terms of what you will be able to buy for them in the US over time. In Switzerland, on the other hand, inflation is currently negative, but so are nominal interest rates, and the two largely cancel each other out for shorter horizons. In Switzerland, your savings (invested in bonds with a negative nominal interest rate, for example) are losing less value in terms of the goods you can buy for them over time than in the US. And yet – some feel that their savings are taxed by negative nominal interest rates in Switzerland, while few feel “taxed” by the negative real interest rates in the US. The reason that negative nominal rates seem so controversial is because of so-called money illusion. The public generally doesn’t distinguish between nominal and real interest rates, and tends to perceive only negative nominal interest rates as relevant for the value of their savings. Money illusion could, in fact, make negative interest rates a much more powerful way of inducing people to spend and invest, rather than save, since they perceive that they will be taxed on their savings otherwise. However, the perception of negative interest rates as an unfair tax risks inciting a public backlash against the central bank – which central banks are acutely aware of. These risks raise the question of whether central banks and other authorities have a responsibility to communicate better and educate the public when using this tool. So do negative interest rates work in practice? The short answer is: yes, but. Cuts to below zero have led to a widespread fall in interest rates throughout the economies that have used them, in the same way that rate cuts do in positive territory. The exception here is the transmission through banks. Click here for a detailed explanation, but for now, here’s the short one. Mostly, when banks cut their interest rates to below zero, they don’t charge for the smaller deposits of households; most of us don’t pay a negative nominal interest rate on our demand deposits. The fact that our banks don’t pass on negative interest to retail deposits could be what is preventing a run to cash. What we don’t know is how retail depositors would react to a negative deposit rate, or how negative the rate would have to be before a large reaction occurred. Instead of charging negative retail deposit rates, banks have generally been able to increase fees on deposit accounts to make up for the loss of interest income. Fees basically amount to a negative interest rate. If you pay a $60 annual fee (or $5 monthly maintenance fee) on your deposit account, and you hold an average of $2,000 in that account, it’s the equivalent of paying a negative 3% interest rate. In some of the negative interest rate countries, banks have also been spared some of the cost of negative rates by having large parts of their money parked with the central bank exempted from the negative interest rate. There are many possible reasons for why banks do not want to flag negative interest rates on small bank deposits, such as a desire not to lose valuable retail customers. But it is important to note that banks have other sources of funding, and some bank deposits (i.e. the large deposits held by firms and pension funds, large term deposits) do have negative interest rates in the affected countries. Interest rates on bank loans have generally fallen, but not as much as loan rates usually fall when the central bank cuts interest rates. In Switzerland, some interest rates on long-term mortgage loans even increased. These cross-country differences are still not well understood and could be related to differences in the banks’ competitive environment. All interest rates in money and bond markets have fallen, however, and as a general rule, negative interest-rate cuts have transmitted in largely the same way to broader financial markets as interest-rate cuts transmit when they are above zero. Despite this, the economies that have cut interest rates to below zero have not experienced major recoveries. Doesn’t this mean that negative interest rates don’t work? Well, no, for the simple reason that central banks would usually have to cut interest rates a lot further to get a recovery going. Cuts to below zero so far have been tiny. Japan’s recent rate cut into negative territory, for instance, was from a positive 0.05% to a negative 0.10%. The Swiss central bank cut its rate to 0.75% below zero. Most of us would barely notice an interest-rate reduction of 0.15% on our deposit account, and securing a bank loan for 0.75% less wouldn’t make many of us rush out to buy new cars. To really boost an economy with an interest rate cut, central banks normally do a lot more. By comparison, the US central bank cut the interest rate from about 6% down to about 1% during the relatively mild US recession in 2001, and again by 5% in response to the global financial crisis in 2008. It would, in fact, have cut a lot more in 2008 and 2009 if the interest rate had not already reached zero, which was thought to be the lower bound. This means that while negative rates probably prevented even worse deflationary pressures, the very timid cuts below zero have not been enough to provide an effective boost in most of the countries that have enacted them. The medicine works, but much stronger doses would be needed for a cure. Central banks have hesitated to cut interest rates further into negative territory partly because they were pioneering with negative rates, and did not know whether it would work and whether there would be harmful economic side effects. We now know a lot more, but we still don’t know where the lower bound really is, and as we discuss below, uncertainties remain. Another factor that may have made central banks hesitate is the unpopularity of negative interest rates, and concerns about a resulting public or political backlash. Central banks are cautious by nature. What are the dangers of negative rates? The most important concern when it comes to negative interest rates is that we do not know at which point people, corporations or financial institutions will want to sell all their bonds and bank deposits and demand cash instead. We don’t know where the lower bound is, and inadvertently reaching this point could be bad for the trust and smooth functioning of the financial system. There are various ways and tools to limit this risk. The central bank can stand ready to help banks that lose deposits, and central banks can limit the distribution of cash – but such ideas are controversial and politically problematic. At the very least, reaching the lower bound is likely to force the central bank to increase interest rates again. Other concerns are related to a long period of low real interest rates rather than to negative nominal rates per se. Low real interest rates for long may distort financial markets and increase the risk of financial instability. With minimal returns on bonds, and some banks even charging a fee for holding cash, investors are looking for better investment opportunities. This is exactly how monetary policy is meant to work: to stimulate risk-taking and the economy. But if investors are ploughing money into non-productive financial assets or real estate just because these assets are expected to keep rising in value, and because they have few other alternatives, they may be generating bubbles that will one day burst. This risk is not peculiar to negative nominal interest rates, and some argue that such risks may be smaller when the economy is in a downturn. Since the global financial crisis, keeping an eye on market prices, signs of exuberance and excessive financial risk-taking has become part and parcel of conducting monetary policy in response to negative shocks to the economy. Central banks can respond to signs of financial instability in different ways, depending on their mandates and toolkit. Some central banks may be able to regulate risk-taking directly (so-called macroprudential measures), while others don’t have that authority. Others question whether such policies are enough, and call for central banks to raise interest rates in the face of stability risks. But increasing interest rates before the economy has returned to growth obviously risks delaying the return to growth. Some see negative interest rates as a risk to the financial health of banks, pensions and insurance funds. These risks are also mainly related to low real interest rates rather than negative nominal rates per se, and reflect the business models these institutions have adopted back when real interest rates were expected to be higher. Business models are changing, however, and banks in countries with negative interest rates so far have not, on average, seen a fall in their profits as a result of them. While that could change[KS2] , it’s still a risky strategy to raise nominal interest rates today to protect the profits of financial institutions, because it would tend to lead to lower demand and lower growth, which in turn would prolong the period of low real interest rates. It could put even more strain on financial institutions. Negative interest rates have become part of the central bank’s toolkit for responding to an economic downturn when nominal interest rates are already very low. They have worked largely as interest rate policy does in positive territory. This is a success and shows that central banks have a bit more firepower than they thought they had. However, there are limits to how far interest rates can fall below zero in the absence of further measures to reduce general financial and economic risks. With lacklustre growth, high unemployment and stubbornly low investment activity in many economies, policy-makers may want to do more, and monetary policy is far from the only option, although other types of monetary policy measures can be used. Public investment projects and a boost to government spending more generally can go a long way in complementing rate cuts. Government spending has a good track record when it comes to boosting growth, particularly when interest rates are low. Supply-side reforms, ideally combined with fiscal policies, can also help to make economies more competitive and productive by improving the functioning of markets, upgrading educational systems, building critical infrastructure and unleashing entrepreneurship and innovation. Such measures will increase the potential for future growth. If this is understood – and believed – by the public, it could also increase confidence here and now, boosting spending and growth. Note: The views expressed in this article reflect those of the authors and do not necessarily represent the views of the IMF, its Executive Board or IMF management.